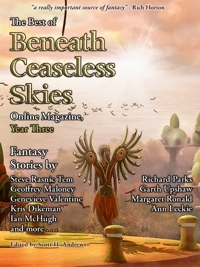 The Best of BCS, Year Three, our most recent ebook anthology, which features Richard Parks, Steve Rasnic Tem, Genevieve Valentine, Geoffrey Maloney, and more, got a great review recently on GoodReads. Check out Best of BCS Year Three on GoodReads, or on Kindle Store or BarnesandNoble.com or Apple’s iBooks, to read what other readers thought and to leave a review of your own! The new BCS anthology, The Best of BCS, Year One, got a very nice plug yesterday on Tor.com. The post was from Hugo-winning editor John Klima, who edits the ‘zine Electric Velocipede. Check out what he said, and pick up your own copy of The Best of BCS, Year One today. It features authors such as Holly Phillips, Marie Brennan, and Richard Parks, and it’s available from Amazon’s Kindle Store, Apple’s iBookstore, and other e-book retailers, in formats for pretty much every e-reader on the planet. Enjoy!